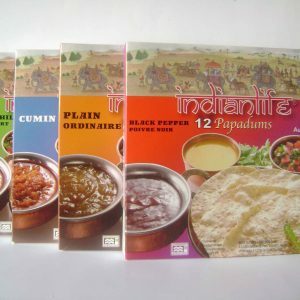 Black Pepper Papadums | IndianLife Foods Inc.
Papadum is a wafer thin spicy Indian cracker or flatbread that is a staple of the Indian diet. Typically, Papadum is made from healthy lentil, chickpea, black graham or rice flour. In Northern India lentil flour is the regional favorite, and the cracker is called a papad. Papadum or papad dough is shaped into thin tortilla-like rounds that are traditionally dried in the sun. 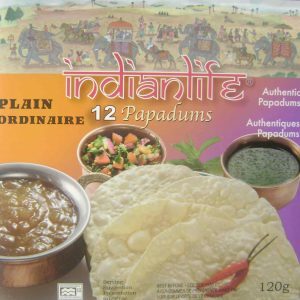 Lovingly baked from a centuries-old Indian recipe, Indianlife Papadum lets you enjoy the great taste of Papadum without the work. Delightful as an appetizer, meal accompaniment or snack, Papadum is typically served during a meal (South India) or at the end of it (North India). In certain parts of India raw papadum (dried but not roasted) is used in curry and vegetarian dishes. A traditional Indian thali or platter always includes papad. 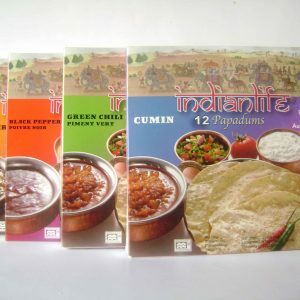 There are so many ways to enjoy Indianlife Papadum. Top with Indianlife chutney or condiments, or try Papadum crushed and sprinkled over basmati rice. Enjoy this healthy food deep-fried, roasted over an open flame or toasted. The texture is up to you, but the taste is always delicious!